More than once, the world has pledged never again: after the Holocaust in World War II, after Rwanda in 1994, then Bosnia in 1995, and most recently after the slaughter in Darfur. So it is no surprise that when reports of alleged ethnic cleansing begin to bleed out, Western policymakers start to squirm. This raw nerve was on exhibit once again this past week, when President Obama on June 15 devoted a special two-minute radio address to an obscure, renewed conflict in the remote mountains of central Sudan. But if the reported atrocities escalate, will words be all the world can offer? Sudan's history is strewn with cases of mass atrocities against non-Arabs in the south and north, with Darfur being only the latest; reports in recent weeks from Sudan's South Kordofan state suggest history could be repeating itself yet again. There, members of a minority, opposition-aligned African ethnic group are being slaughtered "like animals," in the words of one alarming church statement. The diverse tribes live in a rugged land of mud-hut villages called the Nuba Mountains. So far, besides an aerial-bombardment campaign against the Nuba areas, the targeted killings against them have been mostly confined to the major towns, as tens of thousands flee into the hills where, for now, they are mostly safe. But internal U.N. documents obtained by TIME show that refuge might soon come under attack too. Hundreds of military vehicles have streamed into South Kordofan's capital of Kadugli, the center of the bloodbath, according to U.N. reports. Preparations for a major ground offensive were becoming increasingly clear, the U.N. Kadugli base warned in a June 15 confidential dispatch, which urgently called for political intervention to ward off the crisis. Since fighting started two weeks ago, the Sudanese government under President Omar Hassan al-Bashir has done its best to isolate the already remote region to keep information from flowing out and humanitarian assistance from flowing in. But aid workers in the affected area who recently escaped to Juba, the capital of South Sudan  set to declare formal independence in July under a cloud of conflict  tell TIME of a land facing impending doom. "You can see it in all their eyes. They are scared. 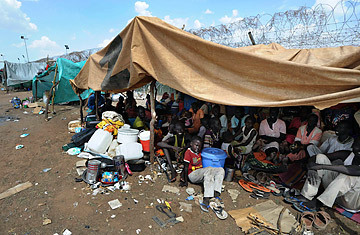 They see this as a fight for survival," said one in an interview in Juba. The children and women pouring in from Kadugli and other towns wear signs of deep trauma and hunger, say aid workers, and tell stories of Arab militias killing anyone who is black. "The government thinks that all black people are opposition supporters and are therefore targets, even if they are children or old grannies," explained an aid worker who had just left the area. One visibly disturbed Nuba aid worker who had fled with his family from Kadugli said the pro-government forces were acting as if under an order to clear out the Nuba population. It is a brutal but old counterinsurgency tactic  draining the pond, to use an old adage  and the Sudanese government has used it numerous times before. The aid workers interviewed predicted that if the ground offensive commences, "absolute carnage," in the words of one, could ensue. None of the aid workers wished for their names or organizations to be mentioned for security reasons. Their accounts align with official statements from church and domestic and international advocacy groups, based on reports they are gathering from the ground. The Anglican Church's Archbishop of Canterbury warned last week, "The risk of another Darfur ... is a real one," and both church and advocacy groups are already using the term ethnic cleansing. While death tolls are impossible to calculate, there seems to be agreement that the number is at least in the hundreds. The U.N. estimates that at least 60,000 have been displaced. But the real fear is over what could come next. The tepid response from the international community so far has been met with frustration, but not surprise. The U.N. has received scathing criticism. Its peacekeeping presence has been confined to its Kadugli base, where it is trying to protect up to 8,500 who have camped there in hopes of finding safety. Egyptian peacekeepers, seen as biased toward Sudan's Arab government, are accused by many Nuba of being complicit in targeted assassinations within the U.N. displaced camp, a charge that cannot be independently confirmed. Whether or not that is true, distrust against the Egyptians among the displaced population was so high that Bangladeshi troops were flown in to guard the camp instead. As for the U.S., Obama's stern appeal to end the fighting has had no discernible effect on the ground. The U.S. special envoy to Sudan, Princeton Lyman, tells TIME that the U.S. is working hard to get a cease-fire  including via a direct meeting with Nuba rebel leader Abdelaziz al-Hilu at his South Kordofan base this past week  but says the Administration is not looking at any intervention plans should the situation escalate. Due to already heavy sanctions, the U.S. has little soft leverage besides incentives  a normalization of ties, delisting Sudan as a sponsor of terrorism and approving the nation's access to international financing and debt relief. Lyman says these things are what Sudan ultimately needs, adding, "Their future depends on coming back to the international community." But prospects of a cease-fire appear slim. Al-Hilu has agreed to negotiate, but only for a lasting political solution that includes power sharing and an arrangement for the tens of thousands of his rebel fighters from the civil war. It is still not clear whether the government in Khartoum is even willing to talk. As for the Nuba, this seems like just another chapter in a familiar history. In the early 1900s, Winston Churchill, then a young British soldier on a military campaign in Sudan, described how a fierce Sudanese battalion was sent down to fight the Nuba, a "mountain people who cared for nothing but their independence," just to give the elite soldiers something to do. In the 1990s, as many as half a million Nuba were killed when the Sudanese government declared jihad against them. When I was in the Nuba Mountains in April, I found a people terrified that war would return but resigned to their frightful and uncertain future. Given their history and the history of their government, they seem to have good reasons to be fearful. See "In Sudan's Nuba Mountains, on the Edge of War." Watch "Blind but Empowered: Voting for a Sovereign Southern Sudan."